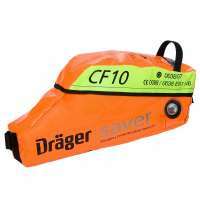 The Drager Safety CF10 is undoubtably the best choice if you need to escape from a Hazardous Environment Safely. When you need to get out of a hazardous environment safely, the Draeger Saver CF10 constant flow emergency escape breathing apparatus is undoubtedly the best possible choice. It is uncomplicated to use, required minimal training, easy to get on and off, even if you wear glasses, have facial hair (or even an irregularly shaped face). These units are highly compact allowing the user the maximum of freedom of movement and easy to store. Automatic activation upon opening is a crucial feature as well as the ability to be easily re set in the event of a false alarm puts these safety units at the leading edge of modern safety equipment. The flame retardant hood is designed to give the wearer a panoramic view of their surroundings and incorporates anti misting and rubber neck seal, which is also ozone resistant. We do recommend that you have your units regularly checked to ensure 100% reliability and safety. The cylinder contents gauge is clearly visible without any dismantling or adjustments to the unit due to a transparent viewing window located on the side of the bag. A transparent viewing window on the side of the carrying bag allows for the cylinder contents level to be easily monitored. When the unit is running close to the end of its air supply it will emit a loud whistle to alert the user to get to a safe environment in time. High visibility orange in colour, easy to recognize and see from a distance, even in low lighting conditions, along with photo luminescent panels make these safety units immediately recognizable. The interchangeable carrying bag, which is flame retardant, waterproof and washable, can be worn in either chest bag or bandolier position and is designed to allow water to drain naturally. The Drager Saver CF10 is designed to give the user 10 minutes of continuous breathable air and is fully EN1146 compliant, as well as SOLAS Chapter II-2 (Marine Equipment Directive & Pressure Equipment Directive). Easy to charge, using standard power connectors, excellent flow characteristics low cost of ownership and exceptionally high manufacture quality makes this unit the first choice for safety!